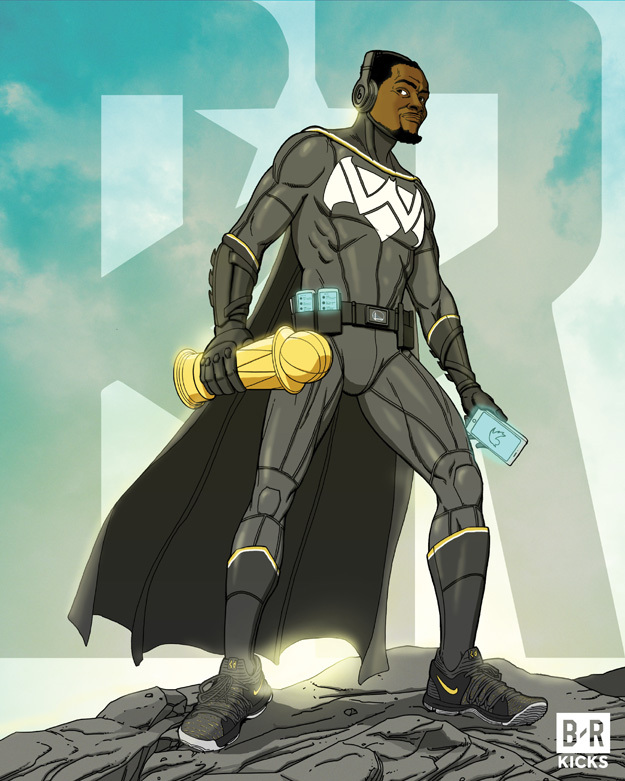 Here’s my illustration of the Batman/ Kevin Durant mashup. It was inspired by the Batman Justice League movie poster. I affectionately referred to this piece as “Bat Durant”. He’s wearing the Nike KD 10 black and gold player exclusive colorway. The outfit’s color scheme is based on the Warriors alternate Slate jerseys. There’s a W for Warriors worked into the Batman chest symbol. There’s a Warriors logo on his utility belt. He has the NBA Finals MVP trophy in his right hand. He’s wearing Beats headphones as KD does whenever he warms up for games. The phone in his left hand is opening up the Twitter app. The other two phones that are visible on his belt are in Twitter conversations. This is a nod to the Twitter “burner accounts” incident.